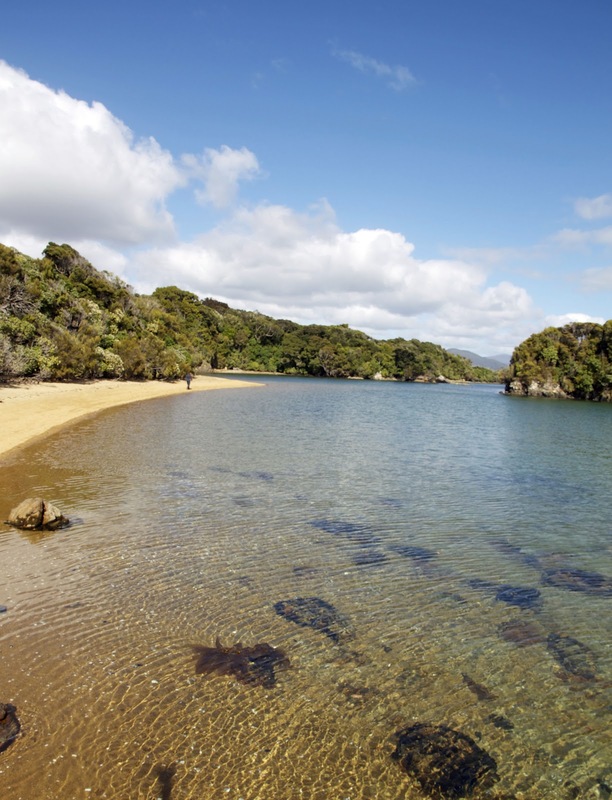 Ulva Island, a small green gem off New Zealand’s Stewart Island, may seem a strange place to ponder the contribution of postmasters to world history. But that’s what began for me when the water taxi landed us at Post Office Bay on Ulva Island. If my first thought was to consider it a bland name for a picturesque site, I suspected there might be a story there if I dug deeper. In this case it’s the tale of Charles Traill, a Scotsman from Orkney, who established the post office here in 1872. He named his seven hectare property “Ulva”, after another Scottish island, and the name stuck for the whole island. There was more to this postmaster’s contribution, but we’ll get to that. First some thoughts about working for the post office. As it happens my first paid employment was for the post office, as a telegram boy (yes, that ages me!) The following Christmas season I graduated to the exalted status of assistant postman. For the first job I cycled the suburbs delivering telegrams. For the next I walked the beat, hand delivering letters and parcels over the Christmas period. It provided a fascinating view of life in many of its forms: from the quirks and kindnesses of people (I received tips and refreshments, as well as dog bites and verbal abuse) to the surprises of the natural world (the shock of sudden storms; the literal buzz of cicada-watching). I later learned that Anthony Trollope, author of The Barchester Chronicles, worked for the post office for much of his adult life. He famously incorporated not only the characters but also whole slabs of the dialogue of some of his customers. In the USA author William Faulkner was a postmaster for a time, and so too were Abraham Lincoln and Benjamin Franklin. What may seem an ordinary, even dull kind of occupation, turns out to be both honourable and capable of revealing hidden depths. And so back to Charles Traill of Ulva Island. This postmaster was also a keen naturalist, who roamed the 3.5km long island observing and collecting plants and animals. He came to recognise the very special nature of the island, and petitioned the government to have it reserved. In 1899 it was declared a “Reserve for the Preservation of Native Game and Flora”, paving the way not only for the Ulva Island Open Sanctuary of today, but also influencing the declaration of the wider Stewart Island/Rakiura National Park around a century later. a place where the natural processes of pre-European times still shape virtually everything that happens. Sitting at 47 degrees south, Ulva is in the path of the roaring forties. It receives plenty of wind and well over a metre of rain each year, but surprisingly the day of our visit is sunny and windless. We arrive before 8am, and wander over to Sydney Cove, where the sun is only just rising over a flat sea. The gentlest of waves plap on the sandy shore, and even the birds call in hushed tones. The warm tranquility is not what we expected, so it is doubly welcome. The tranquility stays with us the whole morning. 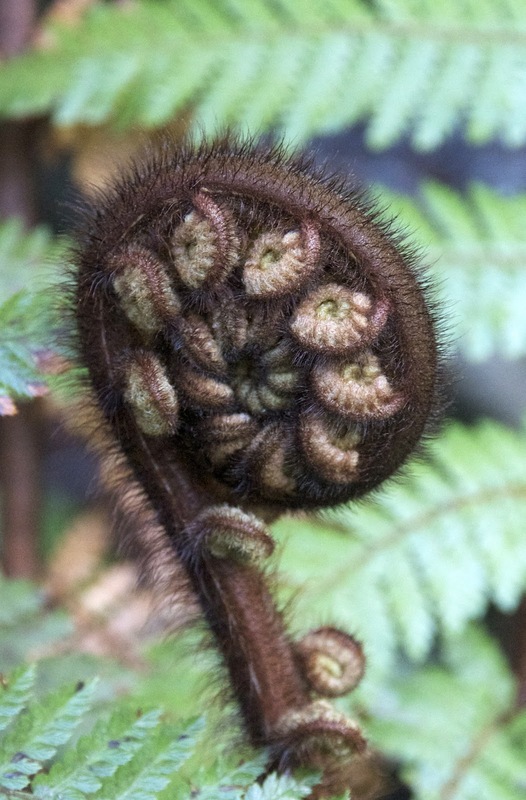 The island is a profoundly peaceful place, thickly forested, deeply green and full of birds and plants that are rare or absent in much of New Zealand. In the four hours we have there we walk every track, enveloped in a green peace. 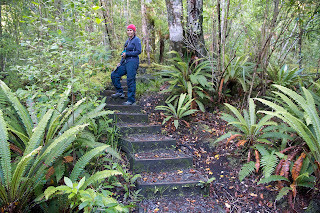 This is a serious “twitcher’s” paradise, and there are rare birds to be “had”, including kiwi, weka and tieke (saddlebacks). Yet even though I am armed with my long lens, somehow just being there seems the best of all possible options. As it is we hear – and then see – a solitary weka. For a moment we think the boom boom call may be a kakapo, but we’re later told that weka can boom as well, and that kakapo are not currently found on Ulva. 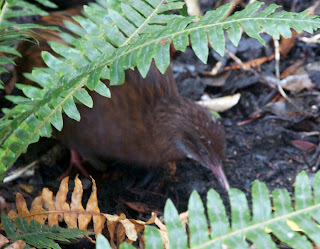 The weka somewhat resembles a kiwi, furtively scratching around in the undergrowth. But its legs and bill are much shorter. 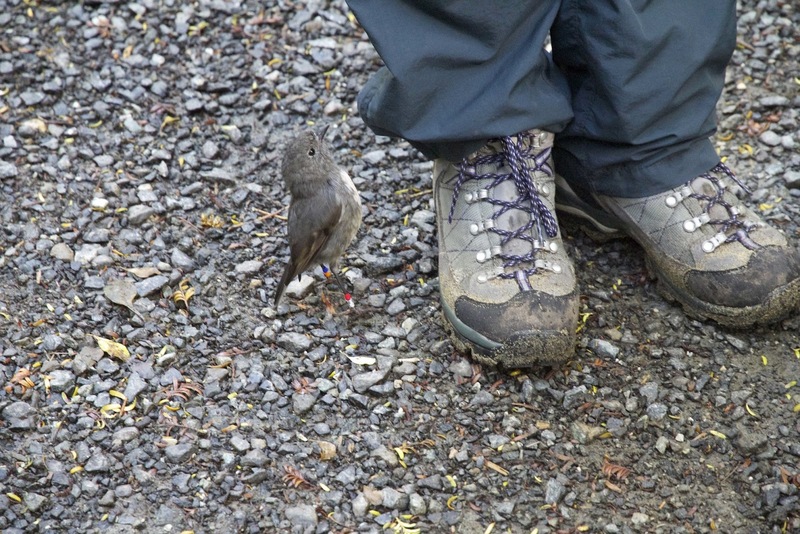 We also meet some bold Stewart Island robins (toutouwai) along the track. They characteristically approach closely to investigate us, and perhaps to find invertebrates disturbed by our footfalls. One even hops on top of my boot, pecking around half-heartedly. These birds have been re-introduced to the island in recent years, and are part of a study into issues of genetic diversity in the re-population of isolated places. All of the robins here have been banded as part of the study. “Our” bird’s bands indicate that it is over ten years old, and if anyone had asked for my medical opinion, I’d have said it was in rude good health! Such could not be said for the general health of native bird species across New Zealand. Introduced predators, including rats, mice, stoats and possums, have made life very difficult for the stunning array of birds that once flocked across New Zealand. Even here on Ulva, Norway rats were somehow re-introduced in 2010. Despite intensive trapping – we passed many traplines on our walk – they appear close to being re-established. What that will mean for species like robins and saddlebacks is yet to be seen. But the vision of its first postmaster has been strongly transmitted to Ulva’s current custodians, be they professionals or volunteers. For them – and for visitors like us – it is plainly worth doing whatever it takes to keep the postie’s vision alive.